Can You Really Make Money Writing For Techopedia? I found this site while looking for websites that actually pay freelance writers. Finding websites that pay writers is quite a challenge, to be honest… but it was this search that led me here. Can you really make money writing for Techopedia? To put it very bluntly, it is a tech website that posts a lot of blog-style articles about all things technology related. They actually do publish content about a wide range of topics. Here is a list of just some of the tabs you can choose from along the main tab menu bar. The style of the website is quite nice. It feels very much like a tech blog, and I feel that the name really fits with what they put out. I was curious as to whether this was a ‘true’ tech site or not, so I took a closer look at some of their blog post titles. Sometimes, websites like this publish more ‘soft-tech’ content, which is not as ‘technical,’ but this did not seem to be the case with Techopedia. All things considered, the site seemed pretty dedicated to staying true to its techie origins. With that being said, the entire reason I even found this site in the first place was because I came across it on a list of websites that supposedly pay freelancers to write content for it… and this intrigued me. As of late, my big project has been to find quality freelancing websites… and by this, I do not mean websites that publish content about freelancing, but websites that hire freelancers to write for them. So Techopedia.com fit right into my search. Next, I decided to take a closer look at the content. 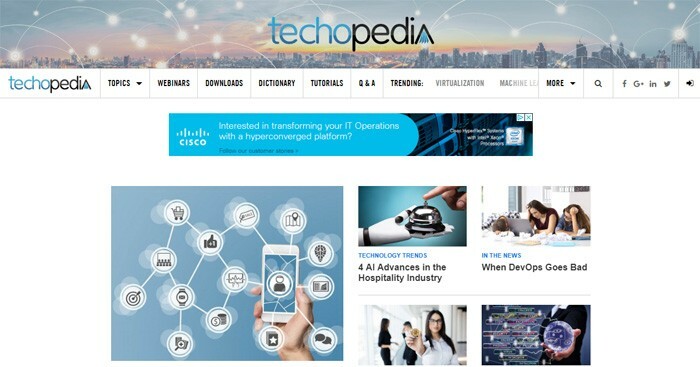 As a writer, I always like to read through some articles on the site to get a feel for the style that they are going for, so that’s the next step that I decided to take on Techopedia. The first article that I read was actually pretty well-done and entertaining, but I will also admit that I did not find it to be ‘A++’ on the writing spectrum. It was a little bit disjointed, and the paragraphs were really smashed together… but I also didn’t see any typos. I mean, it was a fine article… but it wasn’t a FINE article. The second article I read was actually much better. It was written by a different writer, so I am sure that this had something to do with it. This is obviously a website with a varied author base, so there is little doubt that the subtle styles of their articles are probably quite different when you really get down to the details. I honestly really liked what I had looked at so-far, if that means anything. I read through some more articles and got a little bit better of a feel for how they seem to like things written and put-together. I also took a closer look at the writer guidelines and information. Here is what I discovered about that. 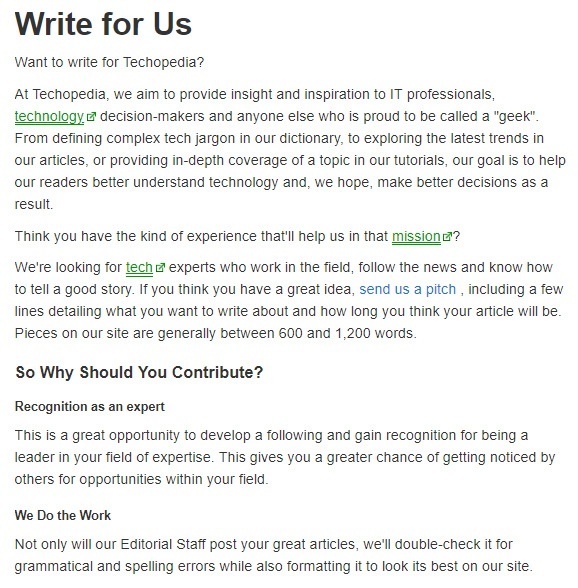 Here is a screen shot of the top of the ‘Write For Us’ page on Techopedia. As you can see, they do a pretty good job of describing what they are looking for. They generally look for pieces that are somewhere between 600 and 1200 words long, and you can send them a pitch, including a few lines detailing what you would like to write about, to see if they are open to accepting it. There are obviously a lot of benefits to pitching and getting accepted by Techopedia.com. For one, they let you publish under your own name, so you gain the recognition for the article. They also help you out by double-checking your content for spelling and grammatical errors, which is a big plus. Third, they pay! They do not say exactly how much they pay, but they do say that they pay ‘competitive rates,’ which is actually pretty awesome. They also have a link on this page where you can email their staff and take a look at their guest-blogging guidelines. But with that being said, it is important to understand that freelancing is not an altogether ‘easy’ thing to do. Writing is kind of a tough business to make it in, which is why we often recommend it as a ‘side hustle’ if you are not sure that you want to commit to it full time. I have done quite a bit of freelance writing as a side hustle. I have also done it full-time on a few different occasions throughout my career. The most important thing to remember about it is that you need to be proactive if you want to find writing jobs. Have you ever heard of the 80/20 rule? It is kind of an old-adage about freelance writing that is true. Succeeding and making money as writer is kind of an 80/20 split, where 20% of your time is spent actually writing, and 80% of your time is spent doing other things that help you to line-up more writing work. So marketing, emailing, pitching, researching, formatting, etc… all of these things actually take up a lot more time than the actual writing part does. A lot of people have romanticized ideas about writing, but the truth is that you just need to pitch, pitch, and pitch some more. Pitch to 50 sites and see if you get any bites. In the end, if you are a good writer at all, you will probably get some work if you put that much effort into it. And of course, furthering your education helps as well. Taking a class in writing, reading a book about it, and brushing up on your spelling/grammar can all be super-helpful. And last, but definitely not least, practice makes perfect. The most successful writers are often the writers who write the most—so write as much and as often as you can. Pitch as many sites as you can, and when you are between pitches, start your own blog and write content for that as well. Having a blog can help you by giving you samples to show potential clients, but it will also help you to polish up on your own skills as a freelancer. I actually really liked this site, to be quite honest. I liked the technical feel, but I also liked how the articles were understandable even on a more basic level. I felt like this was the kind of tech site that anyone could enjoy, not just people who were super experienced in technical subjects—and to me, that was a major upside. Will I be pitching to this site in an attempt to get something published? I actually may. It kind of depends on if I think I can find the right topic. But I think that I could definitely put something together that could have a chance of getting published on this site, so I may look more into that. At the very least, getting published on this site would look good for you as a writer, because it would serve to help you get your name out there. I am not sure how much they pay, but if they really do pay ‘competitive rates,’ then it is likely worth it monetarily as well. The bottom line here is that no single website is going to make or break your success as a writer. Getting something published on a major website could absolutely give your career a positive ‘jolt’ in the right direction, but freelance writing is a long-term grind. And the more you put into it, the more you will get out of it. You will probably not get rich pursuing this line of work, but you will most-definitely find that there is some awesome money to be made—and that is perhaps what it is all about. Side-hustle or full-time-hustle, writing is most definitely an earning opportunity that is here to stay.